The Supreme Court on Monday allowed a challenge to an Ohio law banning lies in political campaigns to move forward. WASHINGTON — The Supreme Court on Monday allowed a challenge to an Ohio law banning lies in political campaigns to move forward, ruling that two advocacy groups could challenge a law that makes it a crime to make knowingly or recklessly false statements about candidates that are intended to help elect or defeat them. Lower courts had dismissed the case, saying the groups seeking to challenge it had not faced imminent harm sufficient to give them standing to sue. Justice Clarence Thomas, writing for the court, said the groups “have alleged a credible threat of enforcement” of the law and so were not barred from pursuing their challenge to it. antiabortion group, and Coalition Opposed to Additional Spending and Taxes. Both had sought to criticize Steve Driehaus, former representative and a Democrat, in the midst of what turned out to be his unsuccessful 2010 run for reelection to the House. They asserted that his vote in favor of President Obama’s health care law, the Affordable Care Act, could be interpreted as one “for taxpayer-funded abortion.” The Supreme Court took no position on the truth of that statement. The justices said Susan B. Anthony List does not have to wait until it is prosecuted under the law to claim its First Amendment rights have been infringed. The court did not directly rule on the constitutionality of the law, but the decision sends the case back to a lower court to consider the question. Driehaus filed a complaint against the antiabortion group with the Ohio Elections Commission, which makes preliminary determinations and can recommend criminal prosecutions. It issued a finding of probable cause that the group had violated the law. Driehaus dropped his complaint after he lost the election and before the case had gotten much further. The Sixth US Circuit Court of Appeals in Cincinnati dismissed the groups’ suit challenging the law, saying they no longer had anything to worry about. In his opinion reversing that ruling, Thomas said the groups had shown that they intended to repeat their critique of the Affordable Care Act against other candidates and that “the threat of future enforcement of the false statement statute is substantial.” That meant, he said, that their lawsuit could move forward. Susan B. Anthony List president Marjorie Dannenfelser said the group would move quickly to try to have the law tossed out, saying the truth of political statements should be judged by voters. Both liberal and conservative groups have criticized the Ohio law, saying it stifles the wide debate that is crucial during elections, including negative speech that may sometimes twist the facts. Even Ohio attorney general Mike DeWine declined to defend the law in court, citing constitutional concerns. He sent his deputies to argue for the state instead. The law carries a possible penalty of six months in jail. 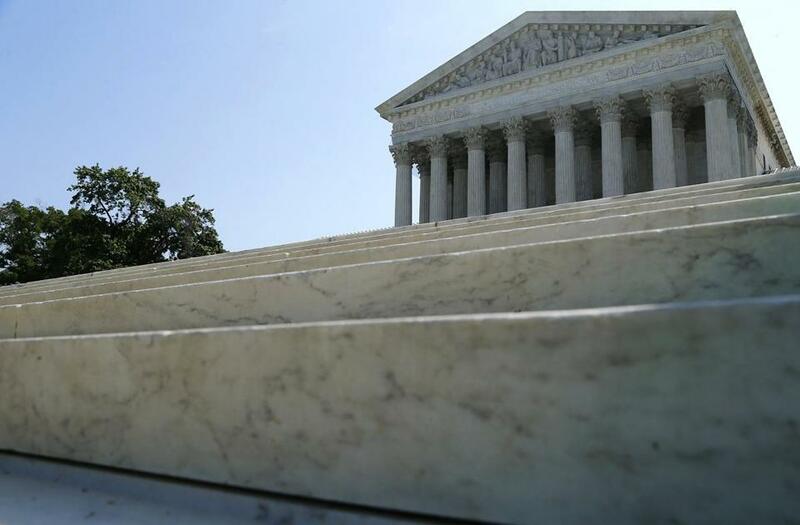 On another matter, the Supreme Court said Monday that it would not hear a case about whether high school graduation ceremonies held in a church violated the First Amendment’s prohibition of government establishment of religion. The court’s order gave no reasons. Scalia, joined by Thomas, dissented, saying the court should have heard the case or sent it back to the lower courts for reconsideration in light of the Supreme Court’s decision last month allowing prayers at town board meetings. Scalia said he knew that some might be offended by the religious symbols in a church. But that sort of offense, Scalia continued, was not a problem under the First Amendment. The case arose from graduation ceremonies held by two public high schools in Brookfield, Wis., at Elmbrook Church, an evangelical Christian institution. Administrators said they chose the church for its comfortable seats, air conditioning, and ample parking. A divided 10-judge panel of the Seventh US Circuit Court of Appeals, in Chicago, ruled that the religious symbols in the church, including a large cross and pews filled with Bibles and hymnals, made it an inappropriate setting.